↑ 1.0 1.1 1.2 1.3 1.4 1.5 1.6 1.7 1.8 "Ebola virus disease Fact sheet N°103". World Health Organization. March 2014. สืบค้นเมื่อ 12 April 2014. ↑ 2.0 2.1 C.M. Fauquet (2005). Virus taxonomy classification and nomenclature of viruses; 8th report of the International Committee on Taxonomy of Viruses. Oxford: Elsevier/Academic Press. p. 648. ISBN 9780080575483. ↑ "Ebola Viral Disease Outbreak — West Africa, 2014". CDC. June 27, 2014. สืบค้นเมื่อ 26 June 2014. ↑ 4.0 4.1 "CDC urges all US residents to avoid nonessential travel to Liberia, Guinea, and Sierra Leone because of an unprecedented outbreak of Ebola". CDC. July 31, 2014. สืบค้นเมื่อ 2 August 2014. ↑ 6.0 6.1 6.2 6.3 Gatherer D (2014). "The 2014 Ebola virus disease outbreak in West Africa". J. Gen. Virol. 95 (Pt 8): 1619–1624. doi:10.1099/vir.0.067199-0. PMID 24795448. ↑ 7.0 7.1 7.2 7.3 "Ebola Hemorrhagic Fever Signs and Symptoms". CDC. January 28, 2014. สืบค้นเมื่อ 2 August 2014. ↑ "Ebola Virus, Clinical Presentation". Medscape. สืบค้นเมื่อ 2012-07-30. ↑ "Ebola Hemorrhagic Fever Risk of Exposure". CDC. August 1, 2014. สืบค้นเมื่อ 2 August 2014. ↑ 13.0 13.1 "CDC Telebriefing on Ebola outbreak in West Africa". CDC. July 28, 2014. สืบค้นเมื่อ 3 August 2014. ↑ Harden, Blaine (2001-02-18). "Dr. Matthew's Passion". New York Times Magazine. สืบค้นเมื่อ 2008-02-25. ↑ "2014 Ebola Virus Disease (EVD) outbreak in West Africa". WHO. 21 April 2014. สืบค้นเมื่อ 3 August 2014. ↑ Leffel EK, Reed DS (2004). "Marburg and Ebola viruses as aerosol threats". Biosecurity and bioterrorism : biodefense strategy, practice, and science. 2 (3): 186–191. doi:10.1089/bsp.2004.2.186. ISSN 1538-7135. PMID 15588056. ↑ "Fruit bats may carry Ebola virus". BBC News. 2005-12-11. สืบค้นเมื่อ 2008-02-25. ↑ 35.0 35.1 Geisbert TW, Jahrling PB (1995). "Differentiation of filoviruses by electron microscopy". Virus research. 39 (2–3): 129–150. PMID 8837880. ↑ Smith, Tara (2005). Ebola (Deadly Diseases and Epidemics). Chelsea House Publications. ISBN 0-7910-8505-8. ↑ "Ebola Hemorrhagic Fever Diagnosis". CDC. January 28, 2014. สืบค้นเมื่อ 3 August 2014. ↑ Büchen-Osmond, Cornelia (2006-04-25). "ICTVdB Virus Description – 01.025.0.02. 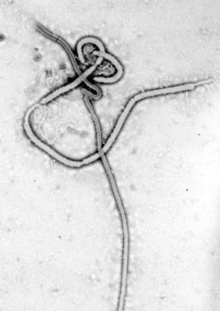 Ebolavirus". International Committee on Taxonomy of Viruses. สืบค้นเมื่อ 2009-06-02. ↑ Suzuki Y, Gojobori T (1997). "The origin and evolution of Ebola and Marburg viruses". Molecular Biology and Evolution. 14 (8): 800–6. doi:10.1093/oxfordjournals.molbev.a025820. PMID 9254917. ↑ Longo, DL; Kasper, DL; Jameson, JL; Fauci, AS; Hauser, SL; Loscalzo, J, eds. (2012). "Chapter 197". Harrison's Principles of Internal Medicine (18th ed.). McGraw-Hill. ISBN 0-07-174889-X. ↑ Gear JH (1989). "Clinical aspects of African viral hemorrhagic fevers". Reviews of infectious diseases. 11 Suppl 4: S777–S782. doi:10.1093/clinids/11.supplement_4.s777. PMID 2665013. ↑ Bogomolov BP (1998). "Differential diagnosis of infectious diseases with hemorrhagic syndrome". Terapevticheskii arkhiv. 70 (4): 63–68. PMID 9612907. ↑ 50.0 50.1 Centers for Disease Control and Prevention and World Health Organization (1998). Infection Control for Viral Haemorrhagic Fevers in the African Health Care Setting (PDF). Atlanta, Georgia, US: Centers for Disease Control and Prevention. สืบค้นเมื่อ 2013-02-08. ↑ "Infection Prevention and Control Guidance for Care of Patients with Suspected or Confirmed Filovirus Haemorrhagic Fever in Health-care Settings with Focus on Ebola" (PDF). Infection Prevention and Control Guidance for Care of Patients with Suspected or Confirmed Filovirus Haemorrhagic Fever in Health-care Settings with Focus on Ebola. WHO. August 2014. สืบค้นเมื่อ 21 August 2014. ↑ Sompayrac, Lauren (2002). How pathogenic viruses work (3. print. ed.). Boston: Jones and Bartlett Publishers. p. 87. ISBN 9780763720827. ↑ Special Pathogens Branch CDC (2008-01-14). "Known Cases and Outbreaks of Ebola Hemorrhagic Fever". Center for Disease Control and Prevention. สืบค้นเมื่อ 2008-08-02. ↑ Lewis1, David (Jul 30, 2014). "Liberia shuts schools, considers quarantine to curb Ebola". Reuters. สืบค้นเมื่อ 2014-08-03. ↑ 67.0 67.1 Oplinger, Anne A. (2003-11-18). NIAID Ebola vaccine enters human trial. Bio-Medicine. ↑ 68.0 68.1 "Ebola/Marburg Vaccine Development" (Press release). National Institute of Allergy and Infectious Diseases. 2008-09-15. ↑ Bush, L (2005). "Crucell and NIH sign Ebola vaccine manufacturing contract". Pharmaceutical Technology. 29: 28. ↑ "Viral Hemorrhagic Fever: Ribavirin Therepy". San Francisco Department of Public Health. Infectious Disease Emergencies. สืบค้นเมื่อ 2014-08-17. ↑ "Canadian Press". CBCNews. Canadian Broadcasting Corporation (CBC). 20 March 2009. สืบค้นเมื่อ 2014-08-02. ↑ Tuffs A (2009). "Experimental vaccine may have saved Hamburg scientist from Ebola fever". BMJ. 338: b1223. doi:10.1136/bmj.b1223. PMID 19307268. ↑ Jeffs B (2006). "A clinical guide to viral haemorrhagic fevers: Ebola, Marburg and Lassa". Tropical Doctor. 36 (1): 1–4. doi:10.1258/004947506775598914. PMID 16483416. ↑ "Sierra Leone Is Epicenter of Ebola as Guinea Clinic Shut". 2014-06-08. สืบค้นเมื่อ 2014-07-30. ↑ Briggs H. "BBC News - Ebola: Experimental drugs and vaccines". BBC News. สืบค้นเมื่อ 2014-08-08. ↑ "Who, What, Why: How many people infected with ebola die?". BBC News. 2014-08-09. หน้านี้แก้ไขล่าสุดเมื่อวันที่ 11 มกราคม 2562 เวลา 13:53 น.